Here are all the goodies that were inside my dad's Glymm box. My mom threw out all the crinkly paper, which is why it doesn't have any of the decorative touches anymore. There are some products that don't provide the exact size, so in order to see the sample value, I made a couple approximations. This miracle serum is 100% natural blend of vitamin E and essential oils. It will leave your skin flawless. Each ingredient plays a crucial role in keeping your skin looking perfect: carrot seed to fight acne, jasmine and geranium to immediately smooth, soften and even skin tone, rosewood and evening primrose to greatly reduce fine lines and other signs of ageing, vitamin E to repair damaged cells and avocado oil to protect your skin from everyday environmental toxins. This product was also featured in the women's glymm box! This exfoliating and moisturizing cream will leave your skin feeling smooth as can be. Glycolic Acid and Algae Extract soften the appearance of fine lines, which Jasmin Absolute helps sooth and nourish stressed out skin. The Glycolic Acid will tingle gently as it exfoliates and boost your skin's natural collagen production. Whoa, I am so surprised as to how quickly this product worked. I put a tiny bit of the product at the top of my hand and after I rubbed it in the fine lines actually disappeared. It pretty much did wonders on that small area of my hand, I wonder what happens if I slap this on my dad's face. Maybe it'll take some years off? This product was featured in the women's glymm bag as well. Dramatically improve your skin's texture and reveal a smoother healthier and more radiant complexion with this exfoliator. Use the power of papaya enzymes to break down dead skin cells and progressively smooth your skin's surface. Designed for Hollywood's entertainment industry, it tingles, tighten's & lightens in 15 minutes. Its poer comes from ancient volcanic pumic rock, super antioxidants and minerals. It activates moisturizing "collagen synthesis", revitalizing complexion for more radiant skin and it penetrates and softens wrinkles and fine lines leaving the skin smooth, supple, and glowing. This is the scent of freedom. Each scent created by Claude Andre Hebert is carefully handcrafted with intentions to bring its subject to a time and place. The story of Bucheron dates back to when Hebert's father used to leave for full winters to go logging surrounded by fir, birch and maple trees. Although the work was taxing, the sense of freedom gained in the lush forest was well worth it. The anti aging moisturizer softens, conditions, and rehydrates the skin. This active skin treatment concentrates the anti-oxidant power of mushrooms and Japanese green tea to fight the signs of aging and protect skin from the environment. Light weight in texture, yet packs a powerful punch, this cream helps reinforce the skin so that it feels firmer, visibly smoother, and minimized the look of lines. Grant For Men is part of Elizabeth Grant's line of products. I have never heard of Elizabeth Grant until a few months back when Glossybox introduced a couple products to me. This is definitely a higher end brand, as you can tell by the price of their products. This full size product pretty much paid for the box 3 times over. This high performance lubricating after save serum refreshes, and softens the skin after shaving while reducing redness and irritation. This triple action serum is specially formulated to focus on men's skin care needs for day and night while providing anti-aging benefits. This non-greasy, hydrating forumla is perfect for day while it helps soften facial hair for a smooth shave at nighttime. So this is pretty outstanding box, especially since I paid $20 for it. But I think it's a little odd that some boxes have an additional 8th item, which was a Ken Men lip chap. My dad only received 7 items. The only "men-specific" products are the Grant for Men products and the cologne, but pretty much all the other products are unisex since they have been featured in past glymm bags. Essentially I could use what's inside the box as well. I'm eyeing to take my dad's Visanti exfoliator and my mom wants Clark Botanical's marine cream. I remember going to Sephora and I was told to purchase the male equivalent of women products because when you dissect everything, it's pretty much the same ingredients. The only difference is how it is marketed. Since women are more willing to splurge, the products that are geared towards women are a little more expensive. I wanted a Glycolic facial wash, so the products I initially looked at was about $35 plus. But then the skincare specialist at Sephora recommended a Glycolic facial wash for men, which was about $20 and basically told me the things I said above. I ended up getting a sample of it to try but I settled for a more medicated treatment. Like all facial washes, it doesn't have a strong scent and even if it does that can be easily hidden by all our creams and perfume. Anyways, if this is any indication of how good quarterly boxes should be then I have extremely high expectations for my Fall inaugural Luxe Box. 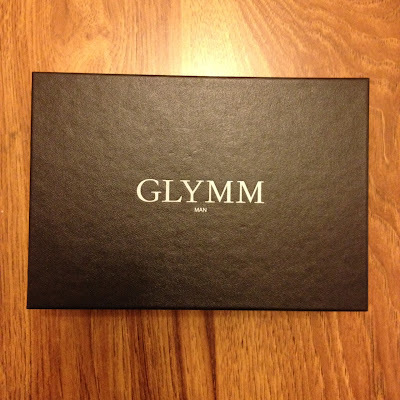 What do you ladies (or men) think of this Glymm Man box? Did you buy one for a special man in your life? I was also really curious about the men's Glymm box - thanks for doing a post on it! Thanks for showing us what's in this man box. They really gave good value for the price, impressive! I wish a man I knew was into this stuff but my husband or dad just really aren't. great review - so glad you posted this. i too thought about getting this for my hubby but i don't want to double up on too many samples - i've received the vitamine and sea, clark's botanicals, glamglow, and vasanti products. there are a few new things though and i think my hubby still would have liked the box so maybe i should give him a gift subscription... hmm... can't decide! Oh wow had no idea there were any other man beauty boxes on the market! I love your blog! New follower here, I found u through bloglovetherapy's blog hop! Oh wow, I didn't even know there was one for men! Neat! ooooh, i want one for my man. "I wonder what happens if I slap this on my dad's face. Maybe it'll take some years off?" Elizabeth Grant proucts aren't really that "high end". She sells constantly on the Shopping Channel. It's a love or hate line.